I never made a map to myself, except through poetry. unless one wants to summon flora and fauna by name. are stages to this, a protocol for intimacy. we might lose our way to the goal. we will own the keys to that city. but sink into stone soil. and worth skimming, but I do not fear drowning. ***We are writing about trips (sort of) over at dVerse today. 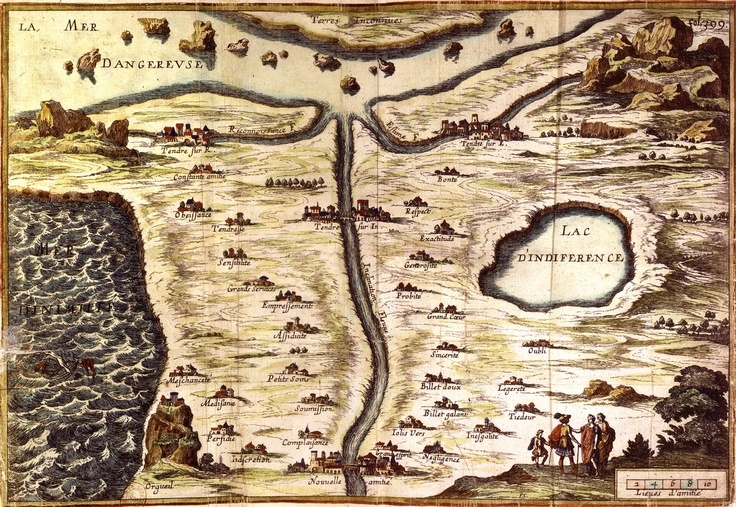 I thought I would write about “La Carte du Tendre,” a map of the stations of love, which is an antiquated allegory from the 1600’s, attributed to Mlle. De Scudery and others. If you are interested, you can read about it (sort of) on Wikipedia. ha – life is a map that kinda draws itself while we go…being not afraid of drowning is a good thing as it makes us brave to swim these oceans and river and discover new shores..ha..i like…what a cool journey life can be..
Claudia–I stumbled over this as it was mentioned in passing in a fascinating poem. Damn, who wrote it? Either way it triggered something in me and I had to write it! a lush and lavish work – with an amazing ending! Susan, this is really wonderful! Thank you so much, YOF! I was tooling around last night online, tripped over the reference, became enamoured, and had to write this! lets make our chat tomorrow ~4pm, I went to the DR yesterday & I’m fighting some sort of allergy or chest cold & am wiped out. okay? Not a problem. Sorry you aren’t feeling well. I am buried under work, so that will be better! Thanks, Polly. Me neither, until last night! There is also one to coquetry, etc. What a lot of fun, and so neatly fits with what we are doing at dVerse today, I had to do it! Beautifully creative, a wonderful read. Go for some playful variations. I enjoyed your whole poem, Susan, starting with you never made a map of yourself except through poetry. Somehow I think that this (for any poet) would be a most detailed map. To me this meant that sometimes we get a bit lost along the way, momentarily forgetting what/who is important as we savor a beautiful view, but hopefully again we pull ourselves together and head onward to the place we were seeking in the first place! Oh, Mary, that meaning, so beautifully personal and yet at the same time universal, I think fits those lines so well! Thanks for the comment–always love your insights. Brian, thank you! I read the prompt on Claudia’s site, and said–pfffft, I am not inspired to write about a journey. But then, I read a poem by John Ashbery last night, “Daffy Duck in Hollywood,” that referenced this map, which I had to find out more about. So, here we are. I really had fun on this trip. Grace, thanks so much! This was one of those that just leaps out of you, dazzled by an idea. Glad you liked this. That is so full of richness and the last stanza is wonderful. It is a poem that will bare several welcome readings to enjoy the full depth. Excellent! Oh my–thank you so much! I really enjoyed tripping over the inspiration for this late last night/early this morning, and am so glad you see the draw. I had no choice but to write this poem after seeing that map. Uh oh. I went to France today, too, but in an entirely different frame of mind. Hee, hee. I’m coming over to see what you did in France. Such a cool idea for a poem, Susan, and well carried out. I found the last two stanzas especially affecting. Hard to know which fork of inclination is self-indulgence and which leads to something more. Such a sophisticated poem. k.
K, thank you! I had to do it, once I found the map. So glad you liked this! I love this Susan, especially the third stanza. The map of tenderness showing the route to love – and the perils that lie in wait for the unwary. As a man, I think women should explain themselves more; what I understand about them could be written on a post-it with a paint roller! The problem is, we are all such different people–we all need unique maps. I agree that we need to explain ourselves more to each other–says the woman who insisted once she was complex in her simplicity. Love the idea of being adventerous with no fear. Some travels are worth the risk. Lovely. Thanks, Eusebia! I agree, some travels most definitely are worth risking. Thanks, Bjorn. Isn’t every trip worth taking a little dangerous? Thanks, Gretchen–two things we need to have to risk our own hearts while mapping another’s. What a marvellous idea for a trip. Thanks, Aprille! I had to do it, after I stumbled on this map. Hahaha–that is true. On the map, it looks no bigger than a pond. You give us a great map from a nice perspicuous view. That’s often the very hardest thing to do in life, to gain the high ground, and to perceive all the passages that we’ve weathered and borne. Gaining that purview itself is a kind of wisdom. And I think your poem’s tonality and voice sustains itself in that spirit. Thank you so much, Charles. I usually find myself int he thick of things, where it is difficult to gain and perspective at all. Thanks so much for the comment. Stunning! Absolutely fascinating and so beautiful (thanks for the link, I’d never heard of this before). Thanks, Rowan, so much! I never had, either, until very late Friday/early Saturday, when I stumbled over it through my reading. I loved the idea of it! Oh, thank you, Mary! I loved the idea of this–a map to the heart. For me your poetry is a 3-D topographical map. Beautiful to behold and get lost in. really great topic and so well-told. Your final stanza is killer-strong, Susan. Thank you, Jane. I had no choice but to write this after I read about this map. Oh, please do, and enjoy! I barely scratched the surface of the map here. So glad you liked this. What can i add it this point? I guess that is speaks to the universality of the map’s meaning and to our need to travel in more ways than one; I especially like the line about the ‘countries we cannot know’…quite the compliment to have your post re-blogged and Googled for wider recognition it deserves. Katy, thank you! Finding the map in the poem, stumbling over it, was definitely a random gift from the universe. Susan, this is splendid, masterful, passions to salty to drink? Good god. I must read it again and again. Loved it! Love it ! Felt like you were talking about me! You are this but be careful I might be that! Misterous poet , woman , friend , mum , individual! But I think I “read” you. La carter du tendre! hmmmmm – lovely and so expertly done – and the layered readings, so cleverly crafted that each reader, including this freudian attarde, can take something away from this excursion and incursion into territories that courtisan(e)s of centuries before us walked with teasing delice. Ah, Noel, thank you for the lovely comment–you made me smile this morning (before coffee, even).